Wonderful or wacky, whatever you think, the flamboyant hat worn by Princess Beatrice at the Royal wedding had many tongues wagging! 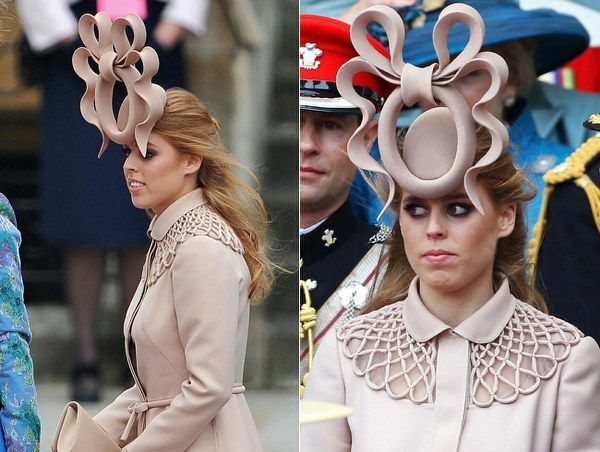 Some compared the creation to a toilet seat and a giant pretzel, and it has inspired its own Facebook page, “Princess Beatrice’s ridiculous royal wedding hat”, which has a following of 137,000 people. It could be yours! Princess Beatrice has put the Philip Treacy creation she wore on eBay! Proceeds of the sale will be split between charities: the United Nations Children’s Fund, UNICEF, and British charity Children in Crisis. In her words: “When my hat started getting so much publicity I really wanted to put it to the best possible use and try and raise some money for the children they help”. The hat is described on the site as “a unique sculptural celebratory headpiece” made of tea rose silk, adding: “This is a gravity defying hat!”. No kidding! Bon Jovi — The Restaurant!